Hermanus is a very popular holiday town to visit; not only is it a very quaint seaside town with a vast myriad of amazing things to see and do, but Cape Town is only 1 hour away. An increasing recent tourism trend is for many people to use Hermanus as their base (rather than Cape Town) and then explore the Western Cape from Hermanus. 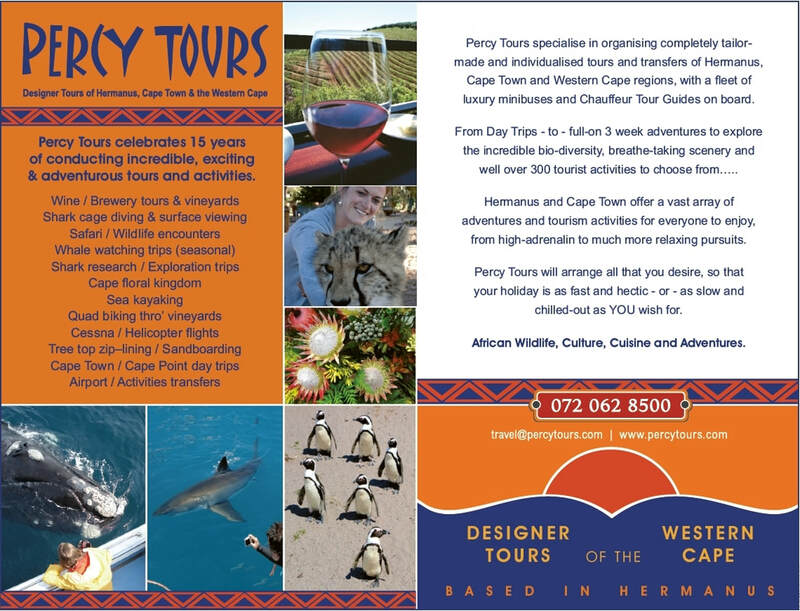 For those that wish to totally unwind and relax while on holiday, then there at least 10 local Hermanus (legal) tour operators that offer aloads of professional transport, transfer/taxi and tour guiding services - including - Cape Town Airport transfers, Restaurant taxis, sight-seeing day trips, Wine Tours to all the 4 major regions, corporate events, Cape Floral Kingdom, weddings, Cape Point, Stellenbosch & Franschhoek, team-building, African animal encounters, including a Safari park only 2 and half hours away and awhole load more - for loads of ideas, please check out our ALL Activities page - or - CONTACT US for even more info and suggestions.